And lo, it was written â€˜manners maketh manâ€™ but just below that it should also read, â€˜and manners can also dump you in a whole heap of trouble.â€™ Such is the way of things in director Jeremy Power Regimbalâ€™s tense home-invasion thriller Replicas; a powerful and compelling movie thatâ€™s likely to leave you slamming the door in the faces of any new next-door neighbours. Mark and Mary Hughes (Joshua Close and Selma Blair) are taking son Brendon (Quinn Lord) to their smart vacation house out in the woods. The family situation is an uneasy one, they are still grieving over the recent death of their daughter in a motor accident. The get-away-from-it trip is meant to be an escape and a refuge. Mark and Maryâ€™s relationship is strained; they express love for each other but flinch and pull back from showing tenderness. An unspoken issue bubbles below the surface. Almost immediately, the not-so-happy family find their peace and quiet invaded by what looks like â€“ at the outset â€“ Hicksville do-gooder neighbours: Bobby (James Dâ€™Arcy), Jane (Rachel Miner) and their boy Jared (Alex Ferris). And, without really feeling like they want to, Mark and Mary are inviting their neighbours round for supper. Or is the reality that the neighbours actually invited themselves? Tensions, anxiety and unanswered questions circle the two families as they eat and make awkward small talk, and one of the filmâ€™s many fine elements is the build-up of fear and expectancy that runs in tandem with this. Somethingâ€™s gotta give and we know the result is going to be unpleasant. Superb direction and a fine script allow us to see the skill with which Bobby and Jane scratch away at the unease between Mark and Mary. Audiences will feel the push and pull of that battle between wanting to tell these interlopers to push off and knowing thatâ€™s actually the last thing youâ€™re probably going to do. When the violence does arrive itâ€™s the suddenness that overwhelms you; itâ€™s the rapid way that Bobby becomes the ogre you already think he is and the unhinged look in Janeâ€™s eyes that seems to suggest sheâ€™s caught in a void between wanting to do right, and finding it easier to do wrong. The scares are all really in the shadows â€“ barring a couple of visceral scenes â€“ and donâ€™t we also know that the biggest chills are the ones weâ€™re thinking of ourselves, not the stuff thatâ€™s on the screen. 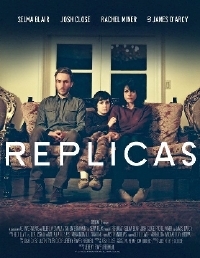 Replicas is a potent, chilling thriller, a cut above the usual psycho-drama fare. This is partially down to clever performances from a cast who seem comfortable with their personas and as eager to embrace the small details of their roles as the set-piece moments. But what really makes it come alive is the powerful cinematography. Right from where it begins â€“ the drive to the woods â€“ Replicas takes place in a monochromatic world. Itâ€™s as if, for Mark and Mary, life has just become black and white, devoid of any vibrancy. Emotion has been drained away, and, ironically, it will take the mother of all scares to put any colour back into it. Superior filmmaking all round, and definitely one to watch out for when it comes your way. So, come on, welcome it on in. What are you afraid of â€¦?